Home > LUGGAGE > Lightweight Luggage > Medium 24-27"
Carry-On lightweight luggage is built lighter and better today than ever before. Pack enough for a family vacation. The Skyway Haven 24-inch Spinner Upright is ideal for up to a week long trip. The case expands with the pull of a zipper for 2 inches of added packing capacity. Quality and stability are the demands that define the high criteria to products of TITAN and come into favor by customers around the globe. To secure the content at any given moment, the trolley comes with a TSA combination lock that is recessed into the shell. The Swiss Bags Tourist Medium Spinner Trolley in Orange will stand out in a sea of ordinary. The Swiss Bags Tourist Medium Spinner Trolley in Black will stand out in a sea of ordinary. The Swiss Bags Tourist Medium Spinner Trolley in Petrol Blue will stand out in a sea of ordinary. Built in TSA compliant combination lock safeguards your belongings. The perfect choice for anyone who wants durable hardside luggage and easy access to organized storage while on the go. Jet-set style outfitted with practical details to make this an ideal large packing case for any trip. A luxurious medium packing case designed with a lightweight four-wheel trolley system for quick and easy maneuvering. The Travelpro Crew 11 26 inch Expandable Rollaboard Suiter Black is ideal for a 4-7 day trip. The Travelpro Crew 11 26 inch Expandable Rollaboard Suiter Indigo is ideal for a 4-7 day trip. 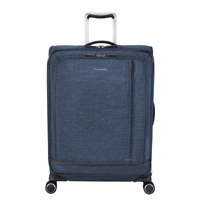 The Travelpro Crew 11 25" Hardside Spinner Navy will handle enough for a 4-7 day adventure. The Travelpro Crew 11 25" Hardside Spinner Silver will handle enough for a 4-7 day adventure. Looking for a specific Medium lightweight bag? Please don't hesitate to ask and we will find it for you!